Epson ink systems need to reset the ink levels to function properly in some cases need to change the battery system to work, how to know when you need to make the change. Epson ink systems run on a circuit that resets the cartridges when they reach their maximum print quantity. It powered by a battery of using watches, which maintains the last setting is made to the circuit this with the passing of time as any other battery discharge and must be replaced. The most secure way to identify when the battery is fully discharged the same system tells us, we will as much as the reset does not last long. It is normal that when the printer says that the ink cartridges are empty, press the button to reset the levels, it happens and it works but only for a moment. After a moment again the same problem that the ink levels are low and need to reset it appears. When this happens, you should replace the battery, is easy and just need to get that has the system — with off and unplugged from the electrical feeder — we carry where a watchmaker "which is where you get easier" and ask you we get a battery of the same. 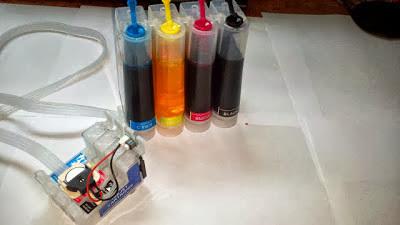 Battery back to its place in the system and then continue printing ink, may need to reset the machine immediately put the battery, this way last longer to see the message of low ink levels again.